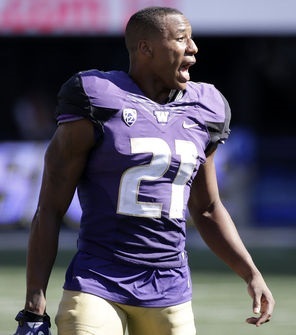 It’s hard to imagine that a Pac-12 defensive back whose team gives up 52 points to an FCS team would be considered a potential first-round NFL draft pick, but such is the case with Washington’s Marcus Peters. The redshirt junior cornerback, who led the Huskies with five interceptions and 14 pass breakups last season, is arguably the best player on a defense that happens to rank 117th against the pass in college football’s FBS division. In UW’s 59-52 win over Eastern Washington last Saturday, that defense allowed EWU quarterback Vernon Adams Jr. to throw for 475 yards and seven touchdowns. Seven touchdowns. Adams is good, but this isn’t Steve McNair at Alcorn State we’re talking about. No Pac-12 team should be getting lit up like that by a lower-division offense. In the third quarter against Eastern, an understandably frustrated Peters drew an unsportsmanlike-conduct penalty for head-butting an Eagles receiver. Afterward, he argued with coaches on the sideline and threw his gloves and helmet to the ground. That outburst earned Peters a one-game suspension. Peters will miss UW’s game against Illinois and QB Wes Lunt, who is coming off a 456-yard, three-TD performance against Western Kentucky. Even though we’re months away from the 2015 NFL Draft scouting combine, Peters’ stock seems to be slipping. While he can’t be solely blamed for UW’s awful defense, he can’t completely avoid blame, either. And now that he’s been suspended twice in his college career — the first time was for part of last year’s Fight Hunger Bowl, for an undisclosed reason — he could be tagged with the dreaded Character Issues label by the time he’s ready to go pro. When Peters gets back on the field he’ll have a lot to prove — not only against a challenging schedule of Pac-12 passers and pass-catchers, but against his own growing reputation as a hothead.